Schematic Design of the future expansion of the River Heritage Museum in Paducah, Kentucky. Top 5 global architect firm, Aedas, are to showcase a new 'landmark design' for a development in Kazakhstan at Cityscape Abu Dhabi 2008. 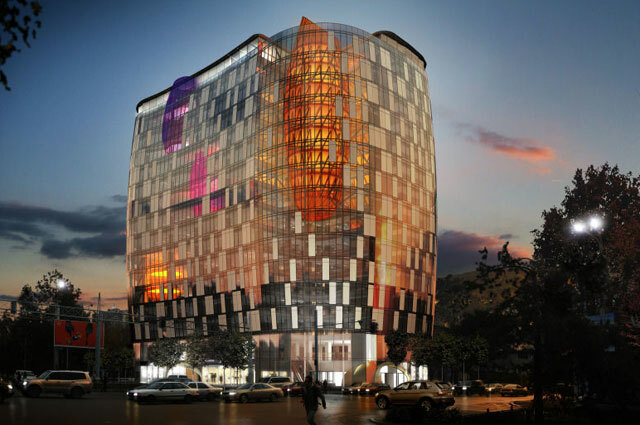 The colourful Abaya Seifullina commercial development will be built in Almaty for clients Platoon. The design is based around a 'jewel box' concept and will incorporate 'crystal' features and suspended pods in the design to accommodate the various uses within the building and create a strong visual presence.